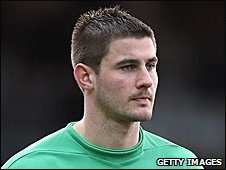 Port Vale have decided not to offer out-of-contract goalkeeper Joe Anyon a new deal at Vale Park. The 23-year-old played in 118 games for the Valiants after making his debut in December 2006. Assistant manager Geoff Horsfield has not been offered a playing contract, but will remain on the coaching staff. Seven players - Chris Martin, John McCombe, Kris Taylor, Lewis Haldane, Louis Dodds, Sean Rigg and Marc Richards - are discussing new deals. "We'll continue negotiating with them," manager Micky Adams told BBC Radio Stoke. "If we can keep the nucleus of the squad together and add to it as well, hopefully we'll have a better season than 10th [in League Two] next season." Anyon won Vale's player-of-the-year-award in 2009 but broke his leg in the 2-1 defeat at Chesterfield in March of the same year and has been restricted to just seven starts this season. Horsfield arrived at Vale Park in July 2009, but a series of injuries have limited him to just one start for the club, which came on the opening day of the season against Rochdale. The 36-year-old has scored 126 goals in 398 games in a career that has seen him play for 11 different clubs, including Fulham, Birmingham City, West Bromwich Albion and Sheffield United.